Higher Secondary schools of Balrampur Zila Panchayat. Candidates have to send applications through online only. Applications received through via CG Vyapam website only. Properly completed applications along with all required documents have submit online via official website of Balrampur Zila Panchayat Office before closing hours on 12-August-2017 @cgvyapam.choice.gov.in. 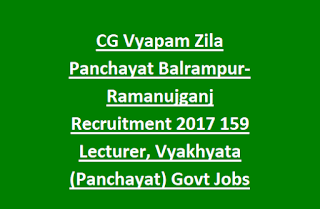 There are total 159 vacancies available in this Balrampur District recruitment of Lecturer (Panchayat). 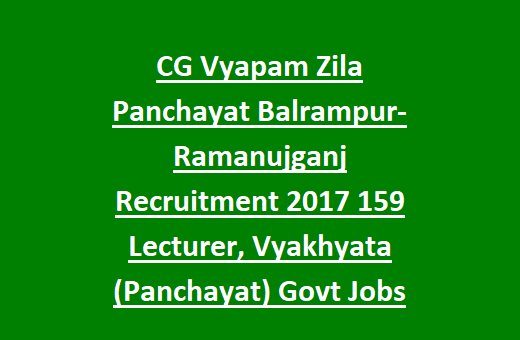 More details are given below for Balrampur Zila Lecturer/Vyakhyata Recruitment 2017. There are total 159 vacancies available in total 8 subjects. Subject wise vyakhyata /Panchayat/Lecturer vacancies are given below. 1. Bachelor's Degree/Post Graduation from a recognized university with B.ED in relevant subject. 2. Preference will be given to PG with B.Ed having candidates and experience candidates. As on 01-01-2017 age limits are 21-35 years. For reserved candidates age relaxation is applicable as per Government Norms of Chhattisgarh. Selection for this Lecturer/Vyakhyata recruitment will be conducted based on Marks secured in written test and exam will be conducted for 100 marks. For B.Ed 30% Marks will be considered for final merit list. Application form downloads from the website of balrampur.gov.in or from the official notification PDF. Download the application form in A4 size paper and fill it with original information. On cover letter mention the subject which is you are going to apply and also mention the community details. Along with the applications form send all self attested copies of educational certificates from degree level, Post graduation level, 10th, and 10+2 level, experience certificate if any and community certificate, date of birth certificate and any other related documents. Filled application must have reach the given address along with all required documents/certificates to "Chief Operations Officer, Balrampur Zila Panchayat Office" through Ordinary Post/Speed Post only before 05:30 PM on date 20-06-2016. And also send the two self addressed cover letters with Rs.5 stamp each with the application form. Download application form here for Balrampur Lecturer (Panchayat) Recruitment 2016. Please share this Balrampur Zila Lecturer Recruitment details with your friends.